The Caspita was designed by Kunihisa Ito, an experienced automotive and industrial designer who have worked for many big companies like GM, Ford Mazda and Nissan. Ito founded Jiotto Design in 1989 and the agency's clients include many big Japanese companies like Honda, Subaru, Yamaha, Sony and Canon. Dome with years on experience in motorsport and composite materials construction developed the car. 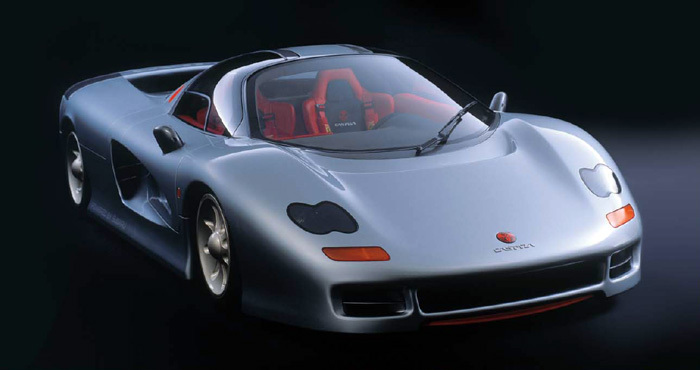 The Caspita was a two-seat mid-engine supercar similar in concept and layout with the endurance and Group C racecars. Dome have already build race prototypes including the Toyota prototypes that compete in LeMans during that period. The actual car was low and wide but not excessively big (length: 4534mm / width: 1996mm / height: 1135mm / wheelbase:2700mm). It was also very light, weighing about 1100-1200 kg. Aerodynamically the car was very advanced. There was a movable rear airfoil and the underside of the car was flat with big diffuser channels in the rear. The suspension with double wishbones and rocker arms controlled the wheel movements while shielding all bulky components from the airflow. Dome was established by using indigenous technology and the Jiotto Caspita was an -almost- all Japanese project. The engine of the car was provided by Subaru and it was a flat-12 derivative of the unsuccesfull Subaru Formula 1 effort (first and second from the left in the photo above). In 1990 Fuji HI acquired the team of Enzo Coloni in order to participate in F1. A new flat-12 engine similar in concept to all Subaru flat-4 engines was developed in partnership with the also Italian Motori Moderni. The Japanese-Italian flat-12 found its way into Caspita similarly to the Ferrari 512BB and Testarossa. The Subaru/MM engine produced 456ps and in the Caspita it was mated to a custom 6-speed transaxle made by Weismann. This engine powered the first prototype but later it was replaced by a Judd V10 engine (image above in the right), also originated from Formula 1. The Judd engine was more powerful with 585ps and gave the car a maximum velocity of 345kmh (up from 320) and a 0-100 time of 3,4" (from 4,7"). The design of the car was simple and effective and it looks stunning and modern even today, 20 years after. The Jiotto Caspita never made it into production, the market for supercars was in decline by the time it was ready. Dome continues to operate successfully and Jiotto Design closed in 1999. The closest thing to a multicylinder full supercar from Japan is the new Lexus LF-A but it is a more of a GT rather than a Group C car for the road like the Caspita. All images from Dome except the engine images from Subaru / Judd.